New listingTaylor made RBZ irons 4-9 +pitching wedge .Callaway rescue .Wilson 3 wood. 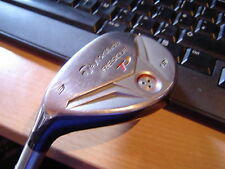 Taylor made RBZ irons 4-9 pitching wedge .Callaway rescue .Wilson 3 wood.. Condition is Used. Dispatched with eBay delivery – Shutl 1 day. KBS Max 85 Stiff Steel Shafts. TaylorMade M4 Irons 5/W Left Hand. M4 irons unlock a new level of straightness, distance, and forgiveness in a product designed to be the longest in our irons lineup. RIBCOR localizes face flexibility, transferring more energy to the ball to increase ballspeed and promote straighter shots. Left Handed Taylormade Speedblade Irons. 6,7,8,9,PW,AW,SW - 7 clubs. 85g Stiff Steel Shafts, Wedge Flex in SW. Standard Length and Lie. Condition is Used. Collection in person. Includes bag plus three and five wood. LEFT HANDED TAYLORMADE TP COLLECTION SOTO PUTTER 34"
Grip - TaylorMade. Length - 34". Live local?. Bring your old clubs with you! Grip Condition - 9 Mint. Shaft Condition - 9 Mint. TaylorMade RBZ 6 Iron. Steel Shaft Regular Flex. Burner 20 lefthand irons in good used condition. R Series TP Tour Grind EF Spin Groove. KBS wedge flex steel. Golf Pride Tour Velvet TM. 54 degrees. Head 7/10, Shaft 8/10, Grip 8/10. Left Handed. Photos are of actual product. KBS Max 85 Regular Flex Steel Shaft. TaylorMade M4 Sand Iron Left Hand. 10g Weights in Ends of Putter. Soft BlackScotty Grip. 34" In Length. KBS C-Taper 105 stiff shafts. REGULAR FLEX ATMOS GRAPHITE SHAFTS. TAYLORMADE M4 IRONS / 5-SW ( 7 IRONS ). M4 irons unlock a new level of straightness, distance, and forgiveness in a product designed to be the longest in our irons lineup. KBS Max 85 Regular-Flex Steel Shaft. 2019 TaylorMade M6 Sand Wedge 55dg Left Hand. M6 Standard Grip. The clubs have their original T - step steel regular flex steel shafts. KBS Tour C-Taper 105 Steel Shafts in STIFF Flex (S). LEFT HANDED. The 5-Iron has not been used at all and is still in its original wrapper. Shaft: KBS MAX 85 Shafts - Regular Flex. 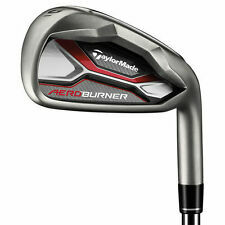 TAYLORMADE M4 IRONS. EX DEMO SET OF. We will always go out of our way to source the product you are looking for. We endeavour to make the experience of purchasing from us as easy and straight forward as possible. Top of its class, RSi opens up a new category of forgiveness in irons. Ball speed and carry distance from heel and toe strikes was higher with RSi 2 compared to its predecessor, the SLDR iron. With an 8-iron, we’re talking a 2-3 yards, which could be the difference between carrying a bunker or not. KBS Max 85 Regular-Flex Steel Shaft. 2019 TaylorMade M6 A-Wedge 49dg Left Hand. M6 Standard Grip. 1 x SET of Taylor Made IRONS. Shaft Flex- Steel "STIFF" Flex. Make- Taylor Made. Lie- Standard. Shaft- 10/10. Shaft Properties - KBS Tour C-Taper 105. 5,6,7,8,9,PW,SW. TAYLORMADE BALBOA TP COLLECTION PUTTER 35"
THIS IS A BUY IT NOW ON A TAYLORMADE BALBOA TP COLLECTION PUTTER. THE PUTTER IS 35" LONG AND IS RIGHT HANDED. THE PUTTER HAS BEEN USED AND HAS SMALL MARK ON SOLE OF PUTTER HOWEVER DOESNT AFFECT PERFORMANCE. TaylorMade Tour Preferred EF R.Series Left Handed 58 Degree Lob Wedge. Club Type Lob Wedge. Model Tour Preferred EF R.Series. Flex Wedge Flex. Grip Golf Pride Tour Velvet. Loft 58 Degree. Bounce 10 Degree. SENIOR FLEX RECOIL F2 GRAPHITE SHAFTS. TAYLORMADE M3 IRONS / 6-PW ( 5 IRONS ). RibCOR localizes face flexibility, transferring more energy to the ball to increase ballspeed and promote straighter shots. 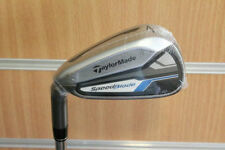 Left Handed TaylorMade RBladez Sand Wedge. With a slight toe hang, a full shaft offset, and two 10-gram weights in the sole, Soto is optimized for golfers who prefer to release the toe through impact. 34" TP SOTO PUTTER. Taylormade TP Collection Soto Putter. TaylorMade Tour Preferred Sand Wedge. Grip: TaylorMade Golf Pride Tour Velvet. KBS Tour V Wedge Flex. Left Handed. (All photos are of the actual club being sold). Condition Details. Get in Touch. Reference: TAWETOURP001. Standard length and standard lie. Fantastic condition. KBS MAX 85g steel shafts.